Andorra Pett on Mars, Andorra Pett Book 2 - Welcome to my Worlds. Why would Maisie kill herself if she’d just had good news? Why is Andi being followed? What was the mystery bequest? When she begins to find the clues that Maisie has left for her, it becomes a race against time. Andi must work out what’s going on and hope that she can get out alive. Richard Dee has a gift for creating fast-paced, funny, believable stories, and this first-person cosy mystery is space opera at its best. 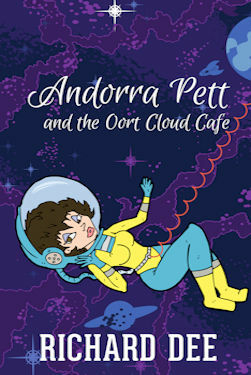 Read Book 1 of the series, Andorra Pett and the Oort Cloud Cafe, for more adventures with this feisty female lead! I’d previously read and LOVED Andorra Pett and the Oort Cloud Café, so when I realised there would be another novel featuring the super sleuth of Saturn herself, I was really pleased and couldn’t wait to get my hands on a copy…luckily, I didn’t have to wait long as author Richard Dee was kind enough to send over a copy. 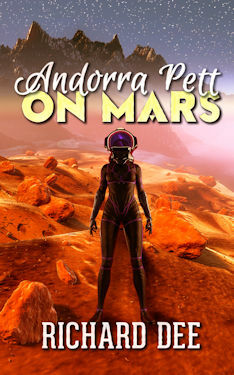 Andorra Pett on Mars satisfied both the sci-fi nerd and crime thriller fan in me simultaneously; it’s an intelligently written tale full of twists and turns that I found impossible to put down! "If you’re a fan of Hitchhiker's Guide to the Galaxy and Agatha Christie style murder mysteries, this novel has it all. " "This book satisfies both the crime thriller fan and the sci-fi geek" Meet Andorra Pett; with her trusty sidekick, she’s taken over a derelict café. On a mining station. It just happens to be orbiting Saturn! She’s hoping for a fresh start, away from all the drama of her old life. It’s a chance to relax and start again in a place where nobody knows anything about her or her past. But the café holds a secret, and secrets have a habit of coming out; whether you want them to or not. And being accident prone doesn’t help. The more you try to pretend that you know what’s going on, the worse it gets. Andorra’s plans for peace and quiet get lost amid the revelations and skulduggery and she soon realises that the fate of the whole station lies in her hapless hands. In space, you can still trip over your feet; the question is, will you land upright? Richard Dee has a gift for creating fast-paced, funny, believable stories, and this first-person cosy mystery is space opera at its best. Read Book 2 of the series, Andorra Pett on Mars, for more adventures with this feisty female lead!